Achieve your fitness goals without having to leave the comfort of your home with the Marcy Pro Multipurpose Adjustable Untility Bench! Save time and money on gym trips and fees with this deluxe gym equipment that lets you perform a variety of exercises with its heavy-duty construction! 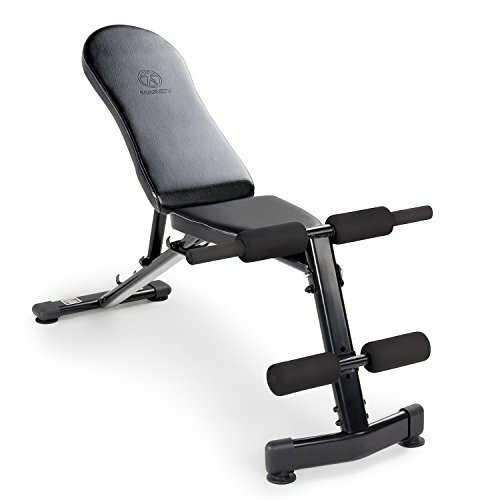 Designed to give you reliable gym gear that will let you work out at home, this Marcy Multi-purpose Adjustable Utility Bench is an all-in-one piece of fitness equipment that will allow you to perform a full range of exercises to tone and at the same time strengthening both your upper and lower body. Made from powder-coated steel that's scratch and chip-resistant, this gym equipment boasts a premium framework that is guaranteed to support a weight of up to 300 pounds. The bench’s adjustable back pad allows four abdominal positions, so you can perform flat, incline, decline, and military style presses with this workout gear. Meanwhile, the specially designed seat is covered with high-density upholstery that facilitates an even distribution of weight. This piece of strenghth training equipment also comes with ankle and knee roller pads. These roller pads let you execute various routines to target the hamstrings, quads, and glutes while providing a special perch for your legs, supporting proper form during workouts. Use the rollers to stabilize your legs and isolate your upper body muscles, and exercise your way to a better-looking physique with this gym gear that offers a safe and convenient way to build more muscles! This equipment’s compact design allows it to be folded for easy storage at your home gym. Engage in a fat-burning and muscle-building workout session with the Marcy SB-228 utility weight bench and get a fitter and healthier body in record time!